Adding function & storage to your home could be as simple as a few furniture swaps! There’s quite a trend of minimalism happening right now, and I agree that we should routinely declutter and get rid of unnecessary products. Or better yet, make sure we REALLY need anything new we’re bringing into our homes. That said, I’m sure you’ve noticed I’m NOT a minimalist at heart. Having extra things on hand makes me very happy IF they’re organized, and I can find them. But what if you live in a house with limited closet space? There are some natural spots around almost every home or apartment where storage potential is overlooked. By swapping out or adding a few key pieces of furniture, you can reduce visible clutter and add function to every room of the house! 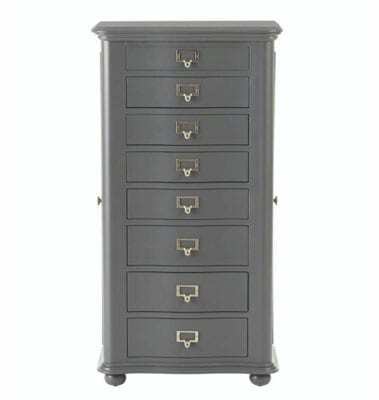 I was browsing around on my new favorite spot for affordable furniture, HomeDepot.com and came up with some examples to show you what I’m talking about! We’ll start with the living room, then move onto the entryway and bedroom. 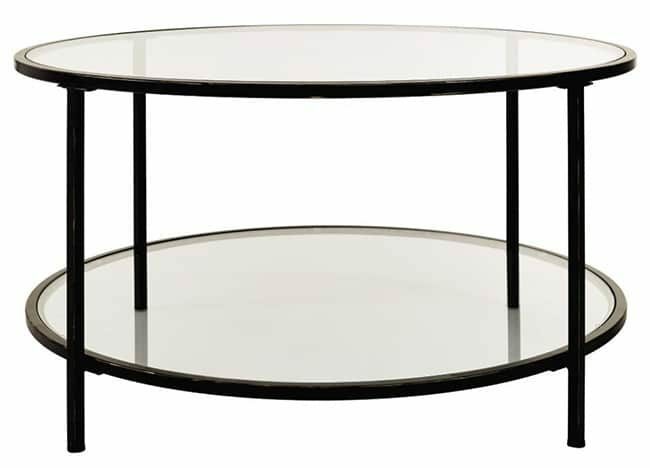 Whenever we’re shopping for new coffee tables, I’m generally not considering anything other than the look. That has been quite an oversight, especially when we lived in a rental with limited closet space. The next time we upgrade, I’ll be looking for one that has a lower shelf! 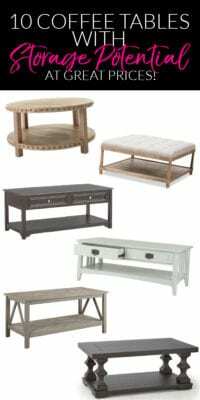 They’re available in every design style and functional for any stage of life, especially if you add baskets or storage boxes. That one is an amazing value right now! This one is a bit pricier than the others I choose, but also a great size, combo of fabric and wood, and classic look. Plus, it’s still under $500! This one comes in two finishes and the price is AMAZING. The bronze is pictured above, but it’s also available in antiqued gold or silver. Still wondering how much difference that one shelf can make? Here are some ideas! Fill the open shelf with stacks of books. You should have room to stack them with the pretty spines out all the way around. Add matching open baskets or boxes to stash toys. They’ll be at the perfect height for your kiddo or pooch to help clean up themselves. Video game controllers making you crazy? Toss them into a cute box on your shelf! You can do the same with the games, movies, and extra remotes. Use pretty closed-top baskets or boxes to conceal notecards, stamps, envelopes, etc. Whether you need to send a bill or thank you note, everything will be together. So much function hidden right in plain sight! 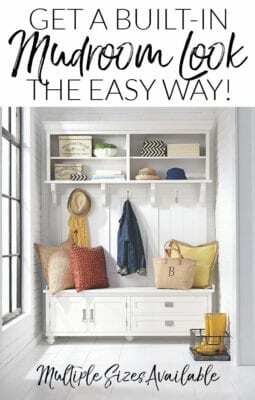 You can mix things up and have throws on one side of the shelf, and a storage basket on the other. I’ve heard from many of you that your bathrooms have serious storage issues. The shelf on your new coffee table could hide a box of nail care supplies like the one I put together in a photo box. In fact, anything in the photo box post from batteries to crayons could work on your new coffee table shelf! 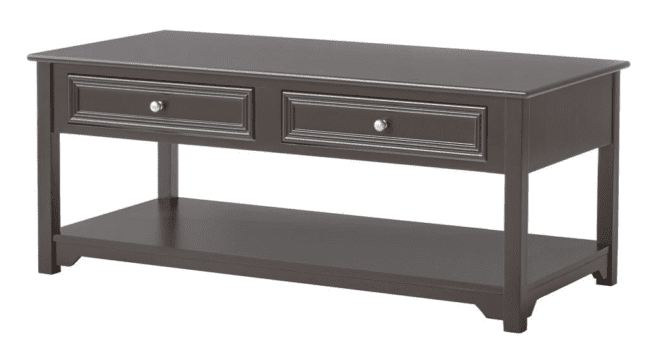 An alternative to the lower shelf design would be an ottoman with storage inside. 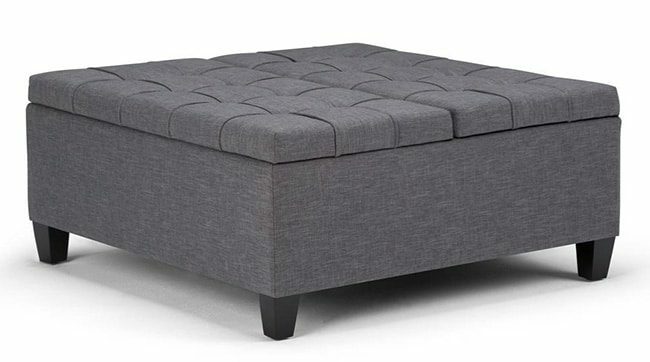 If your space is large enough, I love a big square ottoman. And think of everything you could fit inside – even unexpected items like extra paper goods! I love this gray linen, but it comes in NINE colors! For a more compact living space, I’m obsessed with this industrial/vintage option. It brings big style at a small price. I think we might actually need one for the guest room upstairs. 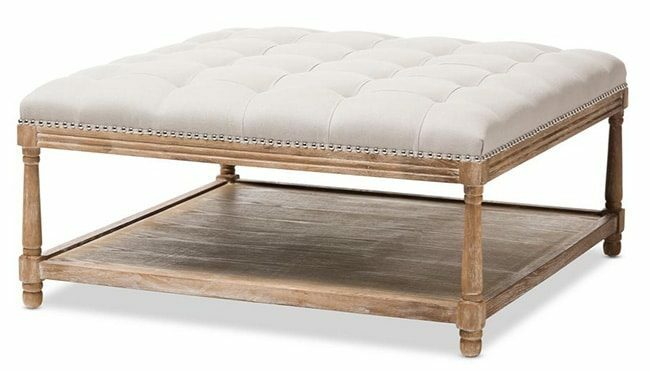 This final coffee table/ottoman solution is the smallest, but the most multi-functional! If you purchase multiple cubes, you can keep them pushed together as one unit most of the time, but then separate them for additional seating when entertaining. They’d look great as either 2 or 3 side-by-side, or 4 to create a larger square. 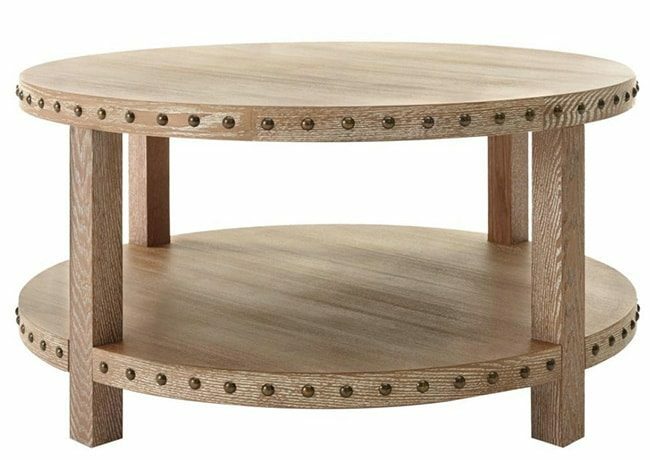 Bonus Living Room Tip: In addition to adding storage to your coffee table, you can also swap out end tables for additional storage. We switched our pedestal style for a unit with drawers last year and I LOVE having the drawer space. While the coffee table option will work in any home, this idea requires a bit of wall space. That said, I found options that take up as little as 2 feet all the way to up to 7 feet. While the ideal scenario would be placing your choice by the front door, some of the possibilities are gorgeous enough to fit anywhere. We’re going to start big because ever since I saw this awesomeness, I’ve been dreaming of ordering it for our own entryway. It adds a ton of storage and looks like a custom built-in. If that piece is above your space limits or budget, there are tons of configurations available. 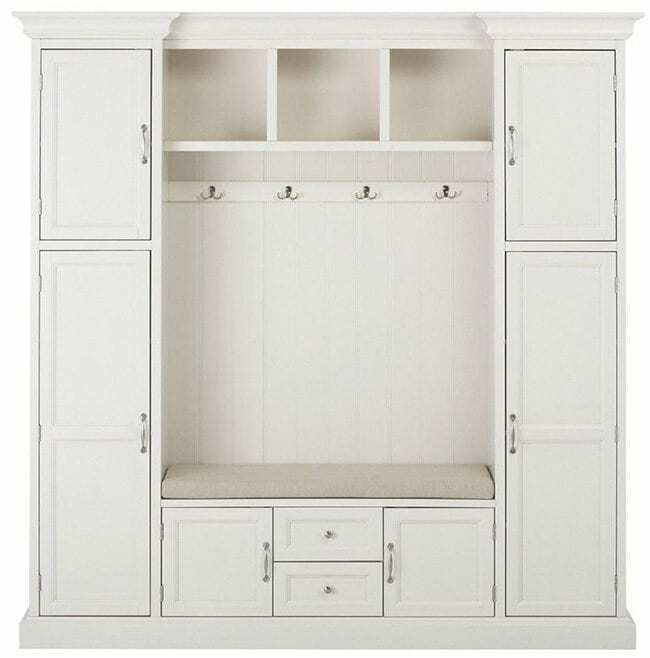 This example is a bit more compact, but still has amazing storage potential with all the upper shelf space. 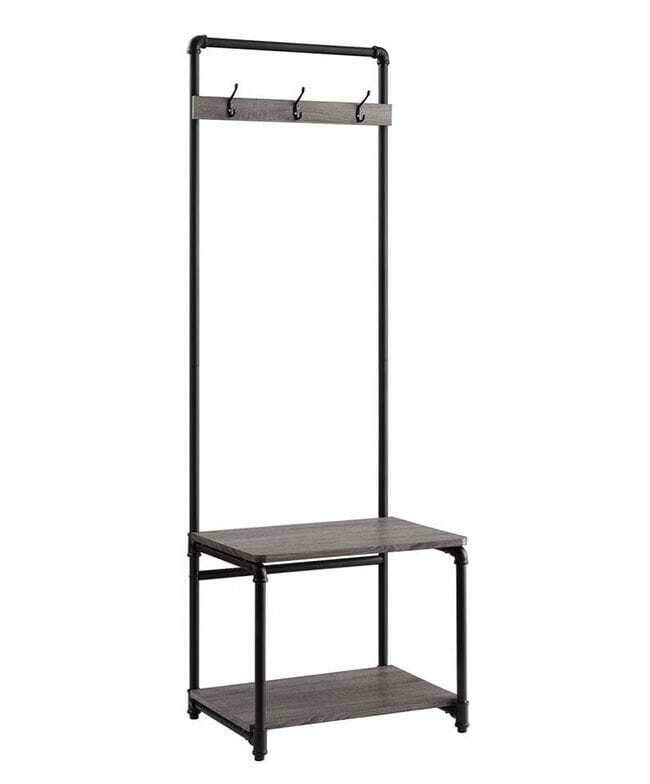 Scaling down the size and price another step, this piece still has storage for coats, backpacks, & shoes. I’d probably do square baskets on the lower shelf to corral the shoes. It even comes in multiple finishes! My last pick will work in as little as two feet of wall space! Plus, it’s affordable & highly rated. Compact Hall TreeAny of these options are ideal for coats, shoes, and backpacks. And not just for kids! I never have a great spot to leave my laptop bag, and Corey’s often ends up on the floor in our tiny entry from the garage. But wait, there’s more. Please tell me you read that out loud in your BEST infomercial voice. In the summer, we need quick access to our pool bag, beach towels, and sunscreen. 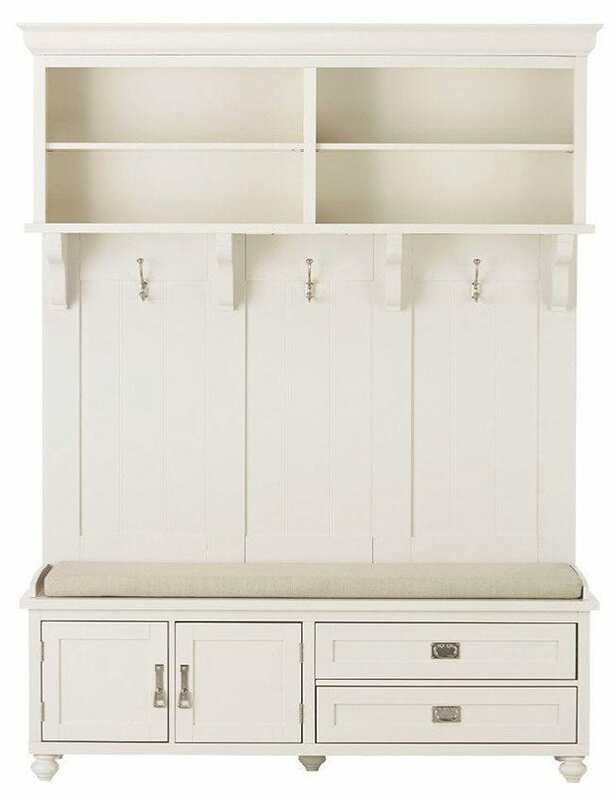 They’d be perfect inside one of the larger mudroom pieces. In the winter, I’d use the same space for gloves, scarves, and hats. Just like the coffee table shelf, nightstands might be able to store more than you have previously considered. 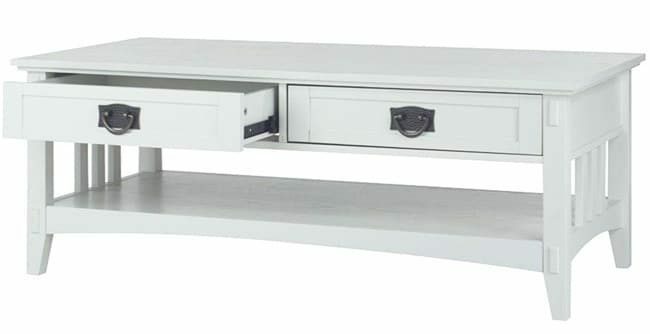 If your bedside tables don’t currently have drawers, they could be working so much harder for you! I mentioned nail care items in the living room section above, but the nightstand is also perfect for anything you can’t fit into your bathroom. Makeup and jewelry can be neatly organized within the drawers! 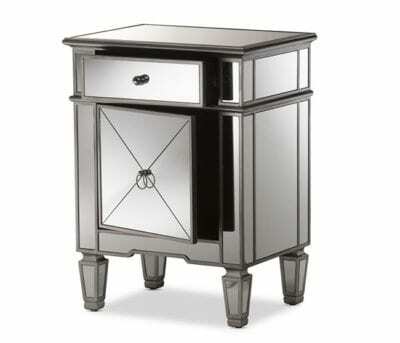 Nightstand drawers are ideal for smaller clothing items like undergarments or swimwear. To think all the way outside the box in this area, you could even create a little craft station right inside your nightstand! 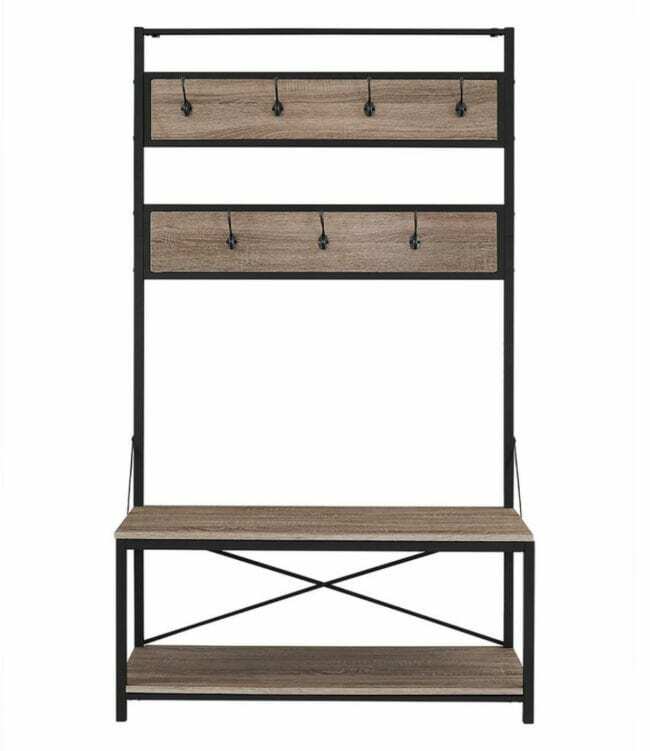 Luckily, you don’t have to give up style for storage. Here are a few beautiful options! 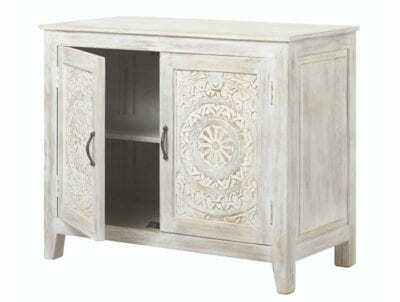 This one is technically a nightstand, but would be gorgeous anywhere in the house! 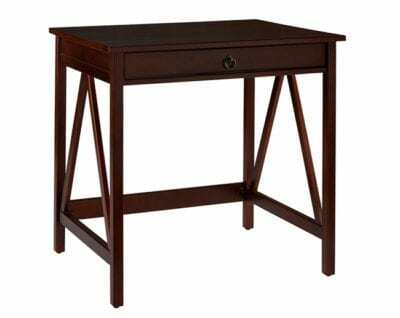 If you need a desk at home, but have no space for an office, consider swapping out one of your nightstands for a desk. 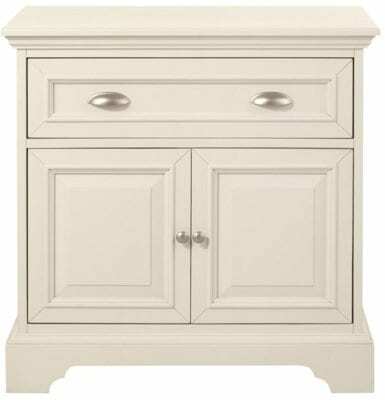 I even found one that’s under $100 and only 31″ wide for smaller rooms! Is your jewelry out of control? My mom tucked a jewelry armoire into the corner of her bedroom, and now everything is organized! I had no idea they came in so many different styles. My mind is churning about whether I NEED one myself now! I sorted them down to only the highly-rated styles for you here. Did you get any new ideas today? 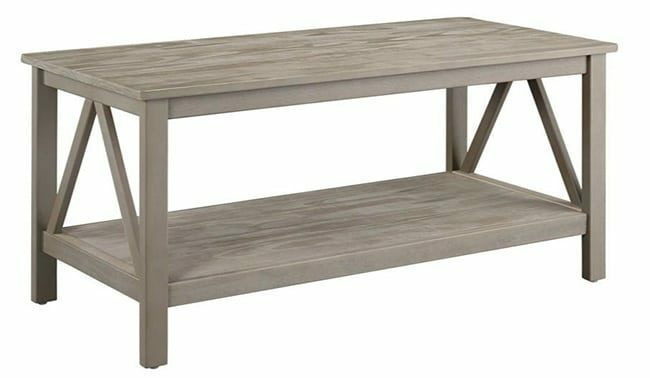 And did you know that Home Depot had all this awesome furniture available online? I really like that you have the option to have things delivered directly to your home or to the store if you don’t want something sitting on your porch all day! 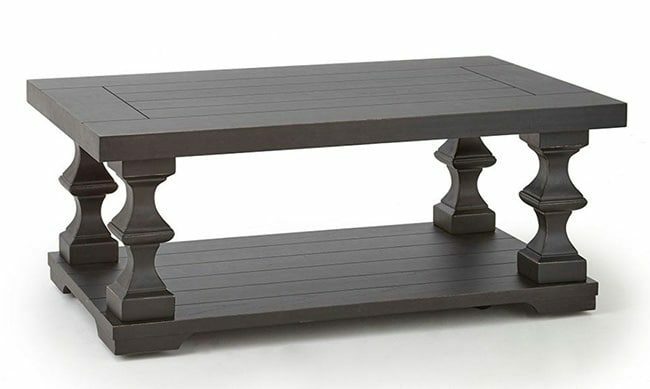 I didn’t know homedepot.com had furniture! Right? I didn’t know before either, so I’m glad they reached out to get the word out. They have such a huge variety of styles and price points. I found some great deals! 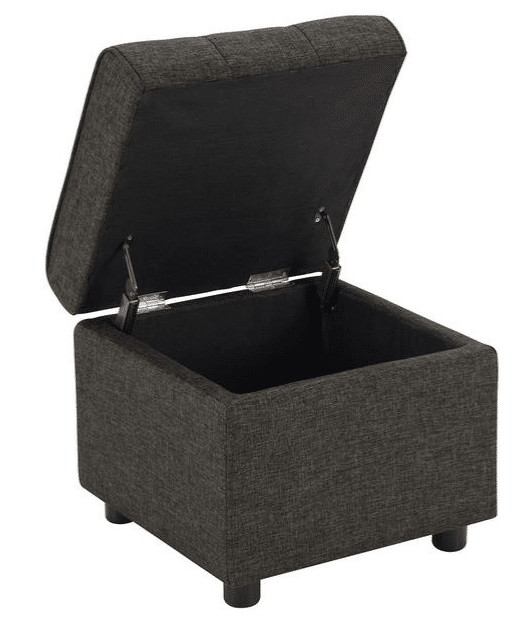 OMG I never thought to use a small storage ottoman in the bathroom…seating AND storage!! Genius! Yes! That’s perfect! 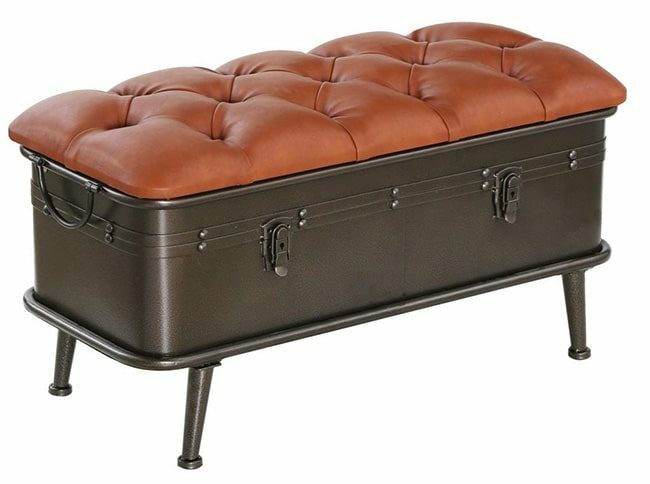 We had a small ottoman in our closet that was really handy, but I ended up stealing it for the office. I need to order one of the storage ones to replace it! Thanks for being so honest! Keeping organized is work! Paper is the bane of my existence! 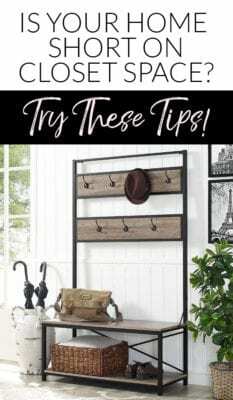 I followed your lead on my master closet reorganization and love it! While I was at it, the bathroom cabinets, kitchen cabinets and pantry were purged. I came up with an alternative design to your killer plexiglass handbag wall caddies (still lusting for them). They are on my “to do” list for after the summer lawn care season is over. I miss the Home Decorators catalog from Home Depot. They had great rug buys! I have 3 indoor/outdoor rugs that look like basket-weave seagrass. Love their classic look! Then I have 2 in a different style on my screened porch. All were 40% off with free shipping and free pads. That is AWESOME! I’ve glad you’ve been able to tackle all those spaces! And yes, I always love paper catalogs too. The good news is that they still have the same deals on the site sometimes!